How can I portray my figurines of porcelain Lladro with a photo camera? First of all, we have to choose the best way to portray the porcelain figurines by trying to have the best possible posture. If the porcelain figurine is low level, sit with one leg curled under you and bring your elbows to your knees to prevent the camera swings; if the approach we’re trying to get is even lower, drop on the floor with legs apart. When portraying porcelain figurines of Lladro in an interior space with natural light, place the piece in a location close to a window, so indirect sunlight can be received, in order to have a special light effect on the porcelain. Work with natural light and with artificial lighting. Do not use fluorescent lights, as distort colors and brightness of the porcelain. For dramatic effect, try a side lighting and in order to soften the shadows put a white card and set a light beside the porcelain figurine, making the light shine. How to do the close-ups of the porcelain figurines? We need a target for close-ups or a telescopic tube to be installed between the normal lens and the camera. The telescopic tube increases the distance between the film and the lens and provides an even greater increase of the photo. Focus on the part of the porcelain figurine that you need to emphasize, as when shooting close up, the depth of focus is scarce. Likewise, remove most unwanted objects that appear, because they can distract from porcelain figurine. 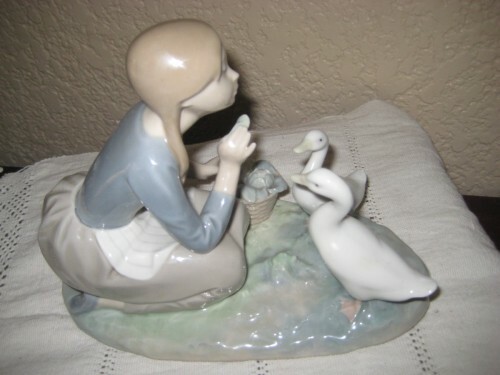 If the porcelain figurine is exposing for a possible sale on internet, place a large cardboard in the back of the porcelain, preferably with a color that make contrast with the true color of the porcelain. If the figurine of the porcelain Lladro is dark, cardboard should be white and if the Lladro porcelain figurine is White or biscuit, cardboard should be dark or black directly. When our intention is only to display porcelain figurine, my advice is to take a picture of the figurine in its environment. The photo should capture the space where the porcelain is located, including the furniture where it rests, the back wall or a general place, where you can appreciate the effect on the decoration. To know how to expose the figurines in a picture is a real important aspect to take into account, because a bad picture could abort the possibility to sell a figurine of porcelain Lladro.